This brings up the details of the .pom file, which has all sorts of good stuff, but the cool part is the icon of the stack of books in the upper right — click this, and it will automatically download the project and set it up as a NetBeans Library, for use in any project… pretty sweet! Of course, this may have been here all along — if anyone knows of a prior version of NetBeans that this works with, chime in! 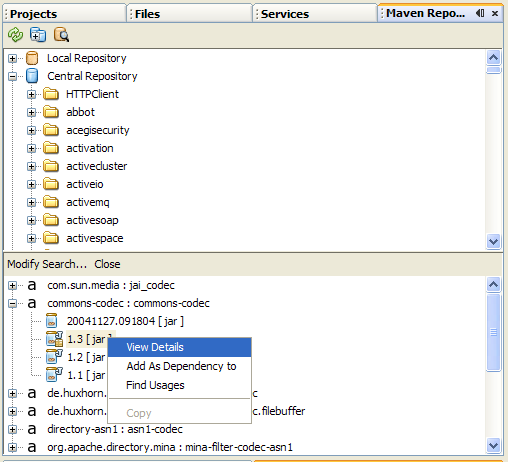 What you can't do, at least not in 6.7 I believe, is set up a dependency on a maven *project* (i.e. the sources instead of the jar). This is necessary if you want to retain all of the cross-project refactoring capabilities. That said, my 6.7 install seems a bit buggy as far as maven goes, so ymmv.